Like the exterior of the stunning Royal Pavilion, the roof was not built with practicality in mind as I discovered when I was given a tour (with my mum!) by Martin Ellis, Senior Marketing Officer, and Gordon Grant, Senior Conservator. The Pavilion of today was built around an older building, the ‘Marine Pavilion’, so I was not surprised when I saw for myself that its roof is perhaps not the most efficient of designs. It is extremely complicated and seriously leaked when the building was first completed. There are even drainpipes lodged within internal walls which was obviously asking for trouble. 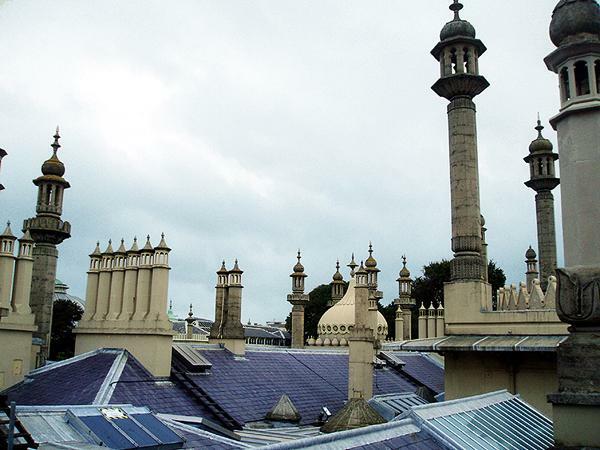 Interestingly, it is still possible today to see parts of the earlier building’s guttering inside the Royal Pavilion’s roof voids. Most of the roof’s surfaces are either leaded or tiled with various sky-lights dotted around just to complicate matters. During the 1960s and 70s, the Pavilion was painted in a distinct turquoise but today the painted areas of render are more in keeping with the exposed areas of Bath stone. The 1980s saw a programme of massive investment yet tragically, in the 1987 storm, a stone ball fell from a minaret through the roof of the nearly refurbished Music Room and dislodged itself deep within the floor. There was a time when many of the roof’s features were fibreglass imitations but they are again all back to Bath stone. During the tour, we entered the cavity behind the Music Room ceiling’s ornate glass panels where servants would once have lit gas lamps for the pleasure of those below. It was here that I saw part of the intricate array of sensors that monitor damp around the building. Alarm bells ring when a moisture level above 25% is detected. We were also shown an unexpectedly large cavity between the Saloon and the main dome where I saw the fastenings of the Saloon’s great chandelier. It was here that I saw evidence of a much shallower dome that graced the roof of the previous building, the Marine Pavilion. 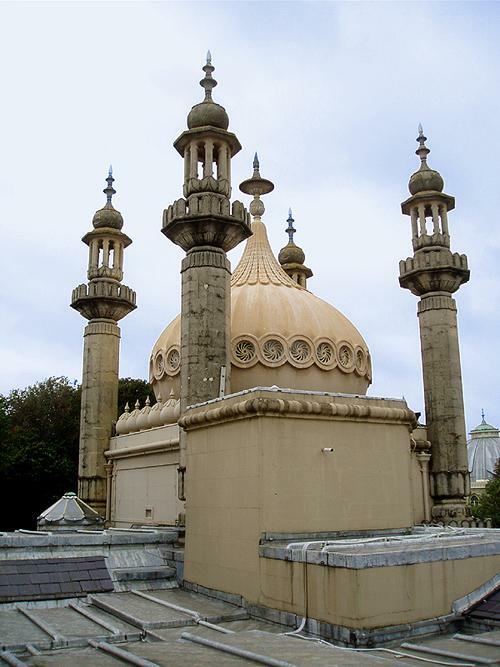 Now that I have walked the hidden passageways, entered the ‘Saloon Bottle’ and been up on the roof of Brighton’s most famous building in this series of three columns, I can appreciate just how complicated it is to run a building of this magnitude. Sure, it’s an overly-complicated, illogical and inefficient building but I now love it even more than I did before.